Event Description : DANCE THEATRE : King Lear-Kathakali performed by Annette Leday and Keli Cie, France. 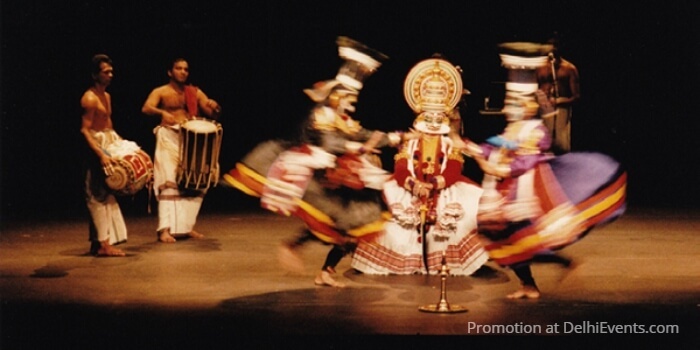 Premiered in 1989, directed by Annette Leday and David McRuvie,King Lear-Kathakaliwas performed in prestigious venues throughout the world for over a decade. The last series of performances took place at the Globe Theater in London in 1999. Since its creation, the production has become a reference in the field of intercultural performance. Kathakali is a classical dance-theatre of India. Dance, a complex gestural language involving hands face and eyes, a broad range of song and percussive music, elaborate make-up and spectacular costumes make Kathakali a total art. In this theatre which is both refined and popular, extreme codification and stylization achieve an extraordinary intensity of effect. The challenge that faces any production of King Lear is to find a theatrical expression for the larger - than - life dimension and explosive power of the play. Kathakali’s rich means of expression and its intensity of effect create precisely the dimension and power that the play requires. Kathakali-King Lear gives Shakespeare a new language of gesture, of colour, and of rhÿhm: it also gives Shakespeare to Kathakali and its public around the world.